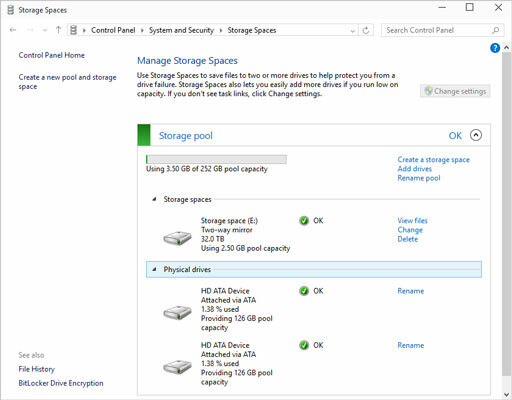 To the outside world, your Windows 10 Storage Spaces looks just like any other hard drive. You can use the drive letter the same way you’d use any drive letter. The folders inside work like any other folders; you can add them to libraries or share them on your network. You can back it up. If you have a cranky old program that requires a simple drive letter, the Storage Spaces won’t do anything to spoil the illusion. That said, Storage Space drives can’t be defragmented or run through the Check Disk utility. Bring up the Control Panel (right-click the lower-left corner of the desktop screen and choose Control Panel); tap or click System and Security, and then tap or click Storage Spaces. Or go to the Metro Start screen, type storage spaces, and look under Settings. If you choose either Storage Spaces or Manage Storage Spaces, the Storage Spaces dialog box appears, this time with a Storage Space. At the bottom, tap or click the down arrow next to Physical Drives. The full Storage Spaces status report appears. Full details of your Storage Space and the storage pool it sits on. The Storage Spaces report tells you how much real, physical hard drive space you’re using; what the Storage Space looks like to your Windows programs; and how your physical hard drives have been carved up to support all that glorious, unfettered space. It’s quite a testament to the Storage Space designers that all this works so well — and invisibly to the rest of Windows. This is the way storage should’ve been implemented years ago! Use your fastest hard drive as your C: drive. (If you have a solid-state drive, use it for C:!) Don’t tie it into a Storage Space. If a hard drive starts acting up — you see an error report, in any of a dozen different places – pro-actively remove it from the Storage Space. Replace it at your earliest convenience. Remember, in a three-drive installation, where two drives are in the Storage Space, the two-way mirror option limits you to the amount of room available on the smallest Storage Space drive. When you need to add more drives, don’t take out the other drives. The more drives in Storage Space, the greater your flexibility.